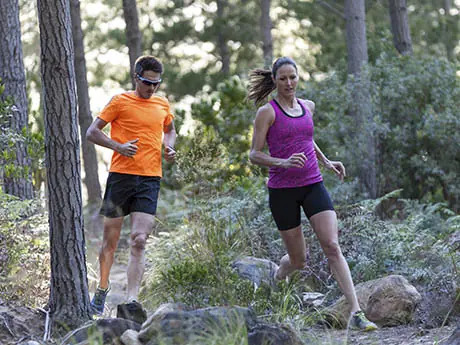 Beautiful scenery, less pollution and lower impact forces are just a few of the advantages that trail running has over road running, but running off-road isn't as simple as just veering off the pavement and into the woods. Trail running presents its own set of conditions and challenges, and being prepared for those ahead of time can make the experience a truly blissful one. Here are four things to consider before you run in the wild. Visions of running all by yourself alongside a mountain stream are certainly attractive, but there are a few reasons why you should consider not going solo on your next trail run. The point of running off-road is that you are far removed from modern-day nuisances like cars, factories and freeways. But this also means you may not have access to any facilities offering shelter, water or assistance. Some locations may even be so remote that cell phone service is spotty or non-existent. If you do run alone, be sure to take plenty of water with you and let someone know your planned route and when you expect to finish. Trail running is serene and beautiful, but it can also be dangerous. Slippery rocks, pokey sticks, thorns, mosquitos and even wild animals are a few of the things you might encounter off-road. I'll never forget the morning I set out on a breathtaking sunrise run through a wooded area along the river, only to find myself pushing through no fewer than 50 spider webs over the course of my three-mile loop. Wearing the right gear can go a long way toward protecting you from bumps, bruises, cuts and bug bites. A good pair of trail shoes is probably the most important piece of gear. The sole should be sturdy enough to protect your feet from sharp rocks and sticks while providing enough grip to safely navigate a variety of terrain, both wet and dry. It may also be a good idea to run in lightweight pants and long sleeves to protect yourself from insects, as well as sharp, thorny bushes and sticks frequently found along narrow, wooded pathways. If you're headed out for a long run, it may be wise to take an extra pair of socks if your feet blister easily. Trail running can often result in wet feet from dewy vegetation, small streams or puddles of standing water, and those wet socks and shoes can cause blisters. Rugged terrain and unstable surfaces can increase the risk for injury, but there are a few exercises to help you avoid the knee twists and ankle sprains that might otherwise occur. Five to 10 minutes of balance training every day can improve knee and ankle stability tremendously, while simultaneously lessening the chance that you'll slip on the trail in the first place. Stand on one foot on a stable surface for 30 seconds. Once that feels easy, progressively work your way onto less stable surfaces, such as a folded bath towel, a foam pad, an inflatable balance pod and eventually a balance board. Agility and plyometric training can help strengthen your leg muscles and soft tissue, allowing you to react quickly, landing correctly on very technical terrain. If you haven't done this type of training before, it's a good idea to take a class or hire a trainer for a session or two to learn proper form and mechanics. The twists, turns, hills and uneven terrain common to many trails all conspire to slow a runner down. For this reason, many runners are shocked by the slow time they turn in on their first trail runs. If you have a trail race in your future, it's important to set realistic pace expectations. Figure out your typical trail run pace by getting in as many off-road training runs as you can prior to race day. Better yet, forget about pace, leave your watch at home and soak in the beauty of the nature all around you.